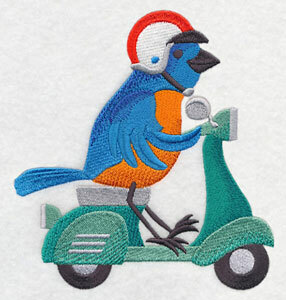 Adorable animals and birds are zipping and zooming and racing their way to your embroidery projects! Scroll down the page to see the colorful menagerie! 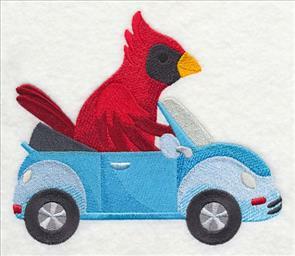 Birds on scooters, foxes on bicycles, cardinals in convertibles. 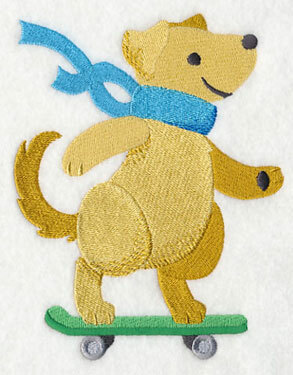 They're oh-so-fun on quilt blocks, pillow shams, jackets, jumpers, and bibs! 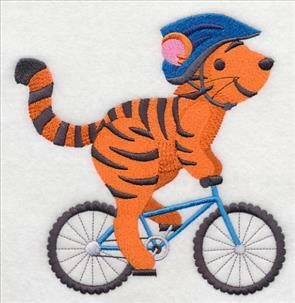 Dress up tote bags, quilts, towels, and jackets, with these wild designs! 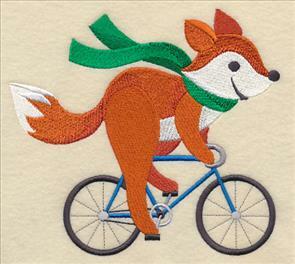 A cheery bluebird putters along on his scooter, while a fox races on a bicycle. 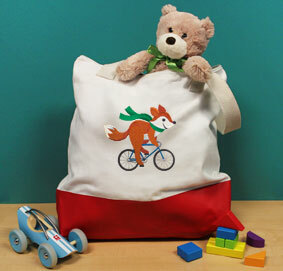 These designs are colorful and fun additions to tote bags, towel sets, pillow covers, and story quilts. 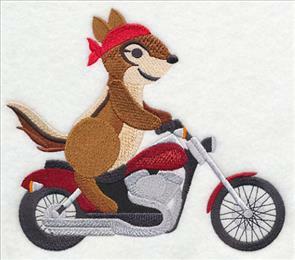 6.51" x 5.90" and 5.33" x 4.83" and 3.00" x 2.72"
Stitch a rough-riding chipmunk, or a cool cruising cardinal, to add energy and flair to your projects! 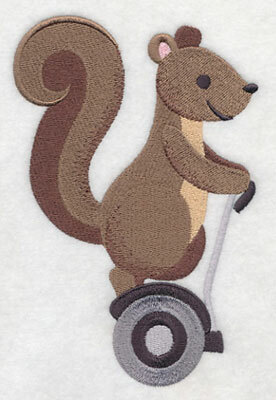 These critters are on the go, and they'll bring wild style to garments and home decor. 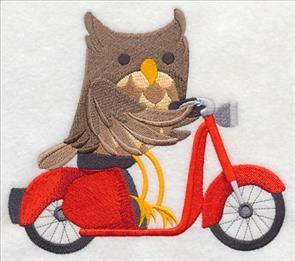 6.83" x 5.90" and 5.62" x 4.86" and 3.16" x 2.73"
A sleek kitten pedals along on a bicycle, while an owl zips along on a moped. 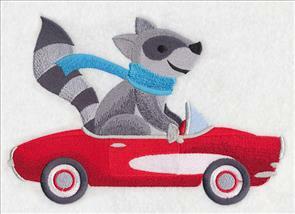 These designs are delightful on blocks for a story quilt, as well as pillow covers and towel sets! 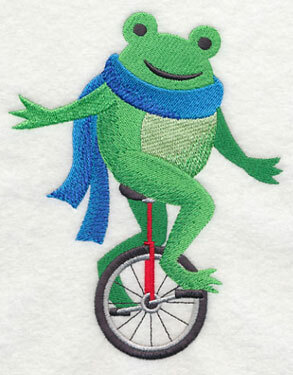 6.75" x 5.90" and 5.57" x 4.87" and 3.14" x 2.74"
A dog enjoys zooming along on a skateboard, while a frog balances on a unicycle. These designs are filled with energy and personality, and will add a delightful look to your projects. 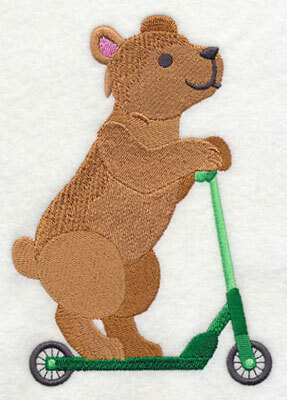 5.08" x 6.40" and 4.11" x 5.17" and 2.78" x 3.51"
A bear zips along on a scooter, while a squirrel balances on a Segway. 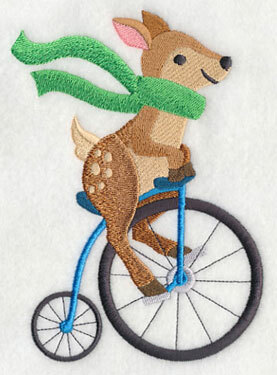 They're sure to bring smiles from denim jackets, fleece vests, and placemats for campers and trailers! 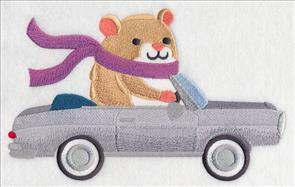 4.29" x 6.40" and 3.47" x 5.17" and 2.35" x 3.51"
A mouse and a raccoon enjoy zipping along with the top down, scarves fluttering in the breeze. 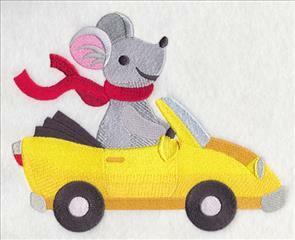 We stitched the cars in yellow and red, but choose colors to match your own wishes and wheels! 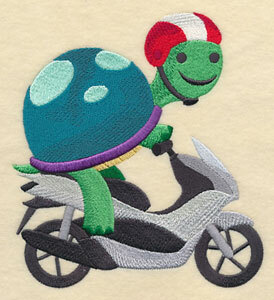 8.49" x 5.86" and 6.86" x 4.74" and 3.86" x 2.66"
Turtles can be slow, but this one is speedy on a sport bike! 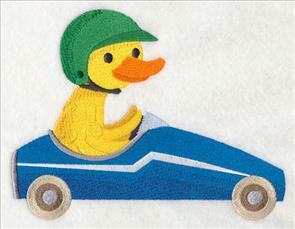 And, a little duck tries his best to win a soapbox derby. 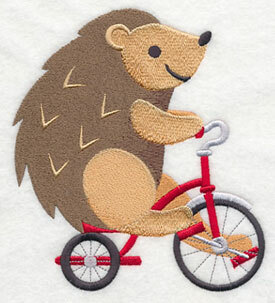 7.54" x 5.86" and 6.17" x 4.79" and 3.47" x 2.70"
A hedgehog pedals his tricycle, while a tiger rides rough on a mountain bike. Children - and adults! 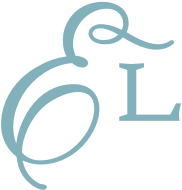 - will love these designs on totes, backpacks, shirts, and jackets. 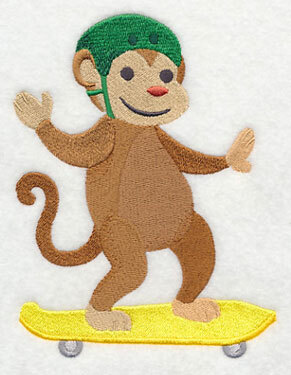 5.90" x 6.03" and 4.85" x 4.96" and 2.73" x 2.79"
A monkey balances on a banana-colored skateboard, while a deer stretches his legs on a penny farthing. 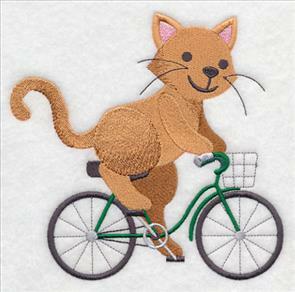 Let these designs race onto quilt blocks, totes, and more! 4.57" x 6.42" and 3.69" x 5.19" and 2.74" x 3.86"
When the sun is shining bright, put the top down! 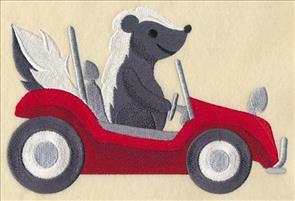 Convertibles are perfect for soaking in the sun while enjoying the scenery. 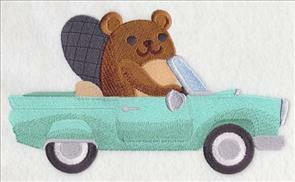 Add these designs to tote bags, pillow covers, and towel sets for classic car lovers! 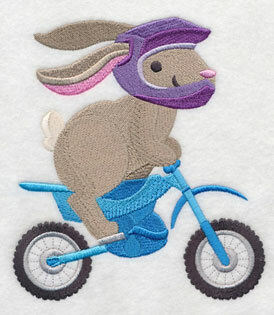 8.53" x 5.38" and 6.89" x 4.35" and 3.87" x 2.45"
This rabbit is oh-so-speedy on his dirt bike! 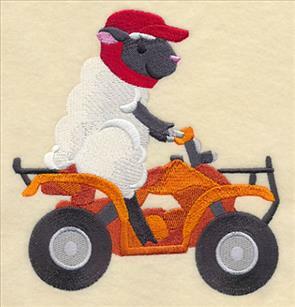 And, a little lamb takes in the scenery while cruising on an ATV. 5.90" x 6.16" and 4.86" x 5.07" and 2.74" x 2.86"
These critters will drive you wild! 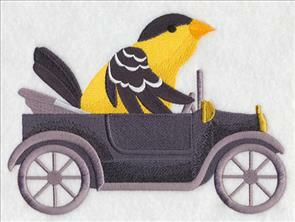 A finch putters along in a classic Model T, while a skunk enjoys a ride in a dune buggy. 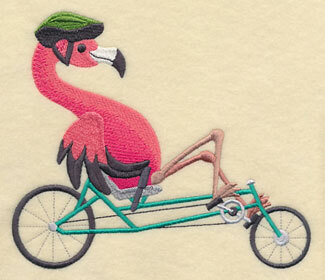 8.47" x 5.72" and 6.84" x 4.62" and 3.85" x 2.60"
This flamingo rides in smooth style on a recumbent bike. The frame is teal, lending a lovely tropical look to the design! 6.93" x 5.90" and 5.66" x 4.82" and 3.86" x 3.29"
25 adorable and charming critters are ready to race their way onto your projects! Order them singly by using the links above, or get the whole gang in a design pack!